Samuel is a very bubbly, fun, full of life young boy. He is energetic, talkative, and loves having conversations with others. Being so talkative makes him an easy child with whom to talk. Samuel does well in school and tries his best. He is the most affectionate of his siblings and is very loving to others. 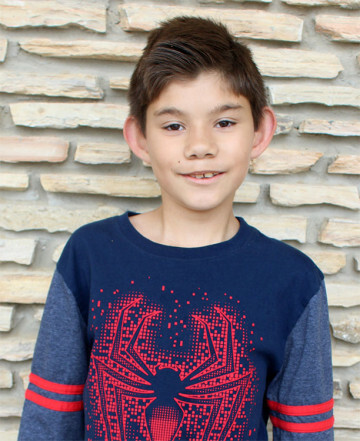 Samuel likes to be kept busy and be entertained by being active, by being outdoors, or by playing video games. He likes being the youngest and being able to rely on his older brother to be his protector and support system. Samuel looks up to his brother. Ely and Samuel are two sweet and loving boys. Both boys have a very strong bond and enjoy doing things together as a family. Together, Ely and Samuel enjoy playing video games and just spending time with each other. Even though they sometimes need some time apart, being happy together is something that is important to both of them and is one of the main things on which they can agree. Ely is shy and at times may require more attention and re-direction. Ely can be outspoken and freely expresses himself once he is comfortable with those around him. Ely is great at having a good time with peers his age. Samuel is very talkative and friendly. He may be very inquisitive, and can at times be easily distracted. Samuel has a big heart and is very caring to those with whom he surrounds himself. Samuel is very affectionate, and is not afraid to show love to those around him. He gets along easily with others. Samuel and Ely have a very strong bond and look forward to finding a forever family. Visit us at the Heart Gallery of South Texas. Samuel will do well with a family who is able to keep up with his energy level. He will thrive with a family who is very active and patient. The ideal family for Samuel is a family who is creative in being able to keep him entertained and his mind stimulated.